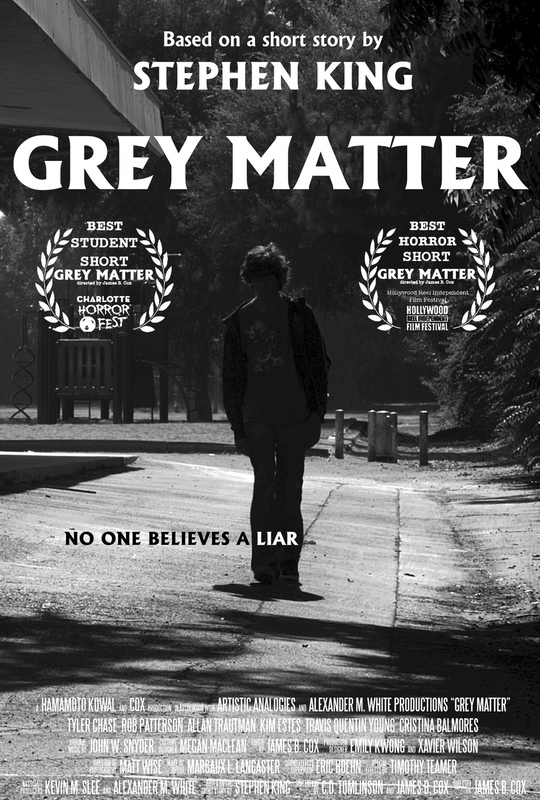 GREY MATTER is the award winning official adaptation of Stephen King's short story from the anthology NIGHT SHIFT. The film tells the story of Issac, a young man who must care for his war vet, alcoholic father after they're both abandoned by his mother. Issac finds release from his trouble at home by acting out in school, mainly by telling lies. Unfortunately, these lies have consequences when Issac's father begins a horrific transformation. The film is one of the few approved adaptations of Stephen King's short stories known as "Dollar Babies." The Dollar Babies (including GREY MATTER) are enjoyed worldwide at Stephen King Fan conventions and film festivals. GREY MATTER was produced at Chapman University's Dodge College of Film & Media Arts with the help of film students from USC, UCLA, and AFI. The film was also shot on location in Long Beach and Orange, CA.